Grease the base and sides of a 23cm/9in spring-form cake tin with a little melted butter and line with greaseproof paper. Chop the gingernuts in a food processor until they resemble breadcrumbs (alternatively, place them into a resealable freezer bag and bash with a rolling pin). Transfer the biscuit crumbs to a bowl and stir in the melted butter until well combined. Spoon the mixture into the prepared cake tin and press down into an even layer using the back of a wooden spoon. Chill in the fridge until needed. Meanwhile, soak the gelatine leaves in a bowl of cold water until pliant, about 10 minutes. Fold the mascarpone, lemon zest, lightly whipped double cream and caster sugar together in a mixing bowl until just combined. Heat the lemon juice and two tablespoons of water in a non-reactive saucepan over a low heat. Once pliant, squeeze any excess water from the gelatine leaves and add them to the warm lemon juice, stirring to dissolve. Fold the lemon and gelatine mixture into the mascarpone mixture until well combined. Marble through the lemon curd, a spoonful at a time. Pour the mixture on top of the cheesecake base, smoothing the top with a palette knife. Cover with cling film and chill in the fridge until set, preferably overnight. 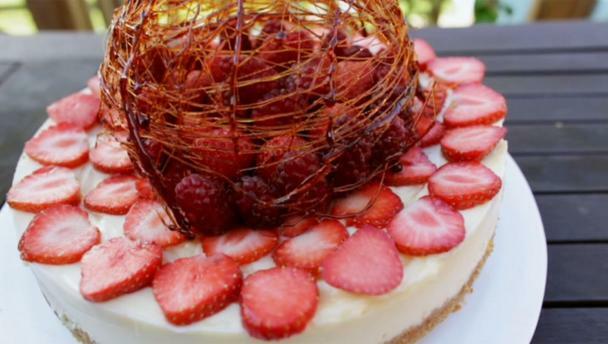 To serve, carefully remove the cling film and spring-form surround from the cheesecake and place onto a serving plate or cake stand. Top with a few summer berries, garnish with mint sprigs and dust lightly with icing sugar. Serve immediately.